Google recently announced the availability of their Chrome OS laptops or officially Chromebooks for mid june. You can now order the Samsung Series 5 Chromebook in 3G or WiFi model and the Acer Cromia in 3G or WiFi models as well from Amazon. They are both scheduled for a June 15 release. 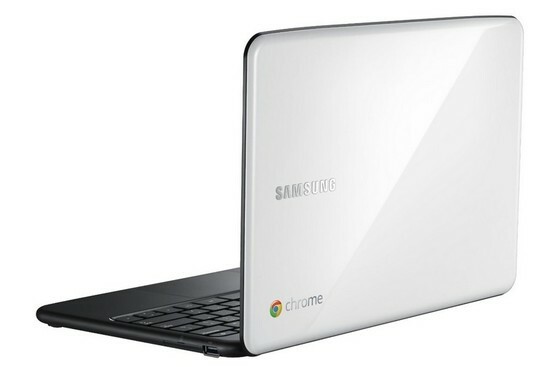 Samsung Series 5 Chrome OS google laptop comes in 2 flavors and 2 colors – Arctic White and the Titan Silver. This Chrome OS notebook has dual-core 1.66 GHz Intel processor and a 12.1″ SuperBright LED backlit high resolution non-glare display. It weights 3.3 pounds with a 16GB solid-state drive and 2GB memory. It also has a built-in speakers/ microphone and a 1MP webcam. The 6-cell battery can last upto 8 hours of use. You can pre-order the Samsung Series 5 3G Chromebook (Arctic White) or in Titan Silver for $499 and Samsung Series 5 Wi-Fi Chromebook (Titan Silver) for $429 with free shipping from Amazon. Acer Cromia is also available in 3G and WiFi models in Black color. It has a 11.6″ HD LED backlit display. It also has a dual core Inter processor with 2GB memory and a 16GB solid state drive. However, the Acer has a 1.3 MP HD webcam and has high definition audio support. It weights at 3.3 lbs and boasts a 6-hour continous battery life. You can pre-order the Acer Cromia Chromebook (3G) for $449 or the Wi-Fi model for $379 with free shipping from Amazon. Both 3G models are equipped with 3G connectivity with Verizon Wireless. For those who like the white Macbook Air look, Samsung Series 5 Arctic white might be a better fit. However, Acer offers an attractive package at an attractive price especially for the WiFi model even though it has a slightly lower battery life. One of these Chromebooks could make for an excellent Father’s day gift if you haven’t ordered one yet for your significant other! You can always use this page or contact page if you would like any Chroms OS help. I use the Google Chrome CR-48 notebook for my blogging needs in and around the house and love it. I am looking at the Chrome OS hexxeh build and chrome portable but more on that in a later blog post. Last but not the least, I have to mention the excellent SquareTrade warranty that covers even drops and spills for new gadgets like laptops, camera, smartphones etc. You can read my iPhone Squaretrade warranty review here. Dell Laptops Price Listnu00a0 welike the white Macbook Air look, Samsung Series 5 Arctic white nmight be a better fit. However, Acer offers an attractive package at an nattractive price especially for the WiFi model even though it has a nslightly lower battery life.